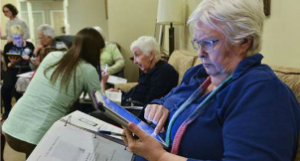 Emphasis is on innovation, feedback at Greenwood Retirement Communities. 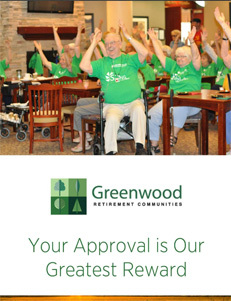 Greenwood Retirement Communities manages a roster of six retirement residences across Southern Ontario that stretch geographically from Peterborough to Hamilton and strive to maintain the mindset that a home is not just where a person lives – but where that person is valued and understood, too. Greenwood is actually a subsidiary of Toronto-based Byron Equities Inc., which was formed to acquire and grow a portfolio of cash-flowing assets through the purchase of existing properties, the development of new properties and the unlocking of appropriate upside opportunities. Byron’s portfolio of retirement residences is managed by Greenwood and the regional portfolio is closely situated to head office to allow hands-on management of the investments, reflecting a belief that attentive, detailed property management is the key to investment success in real estate. The Byron real estate portfolio also includes commercial and industrial properties, owned and managed internally to maximize control of revenue and expenses. The company branched into the construction industry through another subsidiary, Koler Construction Inc., in 2013 – a transaction that reduced the cost of construction projects and portfolio expansions, and allowed for diversification of investments. The connection to Greenwood, however, quickly became more than just a completed deal. 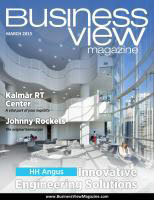 “We never meant to be in the retirement home business, actually,” Koller said. “We started off as a real estate company but we purchased a couple retirement homes and we fell in love. We didn’t have any preconceived notions on what we should and shouldn’t do. We relied on our front line, our executive directors, and, to tell you the truth, in all the homes we’ve purchased and are developing, the executive directors have had 15, 20 years-plus experience in the industry. Koller meets with the directors of each of the company’s eight retirement residences on a monthly basis, to discuss each of the departments that the directors are responsible for and any common challenges they’re encountering, while also throwing the get-together open for brainstorming. Roughly 50 people work at each of the actual residences, while another half-dozen or so (executives, support staff and an IT specialist) are stationed at the Greenwood headquarters office. Six of the residences are up and running and fully functional at this point, while two more – Bramalea Retirement Residence in Brampton, and Harmony Hill Retirement Community in Oshawa – are scheduled to come on line later in 2015. The existing facilities range from 90 to 150 rooms, and, among the new ones, the Bramalea residence will have more than 100 rooms in a converted hotel building and Harmony Hill will include 72 independent apartments connected to a 134-unit retirement home. The average resident age across the Greenwood roster is 87 years old, though the number skews downward toward 65 in Hamilton, where Caroline Place is within close proximity to a sports complex, and art gallery and a library. Meanwhile, the McCowan Retirement Residence in Toronto has converted a whole floor into a hybrid “Memory Lane” environment, which caters to residents suffering from dementia who prefer to live in a retirement home setting rather than a typical long-term care setting. An initiative that started at Caroline Place and ultimately trickled into the other five active homes involves a computer platform called “Point Click Care,” which allows all resident information to be entered at each site and provides backups to prevent the loss of data. It began as a function for bookkeeping, then was put to use as a nursing function as well to track medication administration. 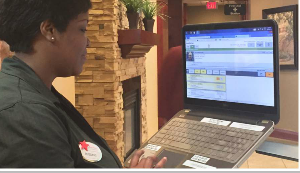 December marked the launch of “Point of Care,” a pilot project which comes under the same technological umbrella as “Point Click Care” and enables front-end staff to track additional resident services like escorts, tray deliveries, showers and toileting assistance. Caroline Place was again the start-off point for the program before a nurse was deployed to other facilities to train their in-house staffs. “All the homes have had some part of the process started and completed,” Steller-Cain said. “I believe firmly in everything being on one site, so we’re not duplicating effort, we’re not making three charts for one thing. It’s very, very innovative. I don’t know of any other retirement home that’s doing it to this extent. Our staff is very good, they’ve picked it up. I’m very pleased that it’s coming along. It’s one of those things that makes you efficient, contains your cost and really adds to your customer service, too. Going forward, Koller’s benchmarking tasks will include heavy emphasis on independent feedback. Residents are annually offered a survey by an independent third-party provider, and the results for the last three years have indicated a tangible uptick in their level of in-house contentment. Staff is also surveyed for feedback and their responses have charted upward over the same time frame as well. Information from all the residences have been combined with others in the province by the Ontario Retirement Communities Association, which provides an even greater opportunity for measurement. WHERE: Corporate headquarters in Toronto, Ont.